Radio Programming Compatibility Requirements (PCR) Working Group Test at APCO Is a Huge Success: Many radio vendors have unique software packages that require in-depth technical knowledge to program a radio. In 2011 during a serious incident, Pinellas County, FL, called on their neighboring jurisdiction for assistance. When then-communications manager, Pam Montanari tried to connect the Pinellas countywide Motorola trunked system with the Harris radios from an assisting jurisdiction, the two systems could not communicate. In response to this incident and to the public safety need for interoperable software that fills a gap between different vendor radio programming packages, NPSTC created the Radio Programming Compatibility Requirements (PCR) Working Group to tackle this problem. The Working Group developed a spreadsheet and asked Project 25 vendors to provide information on the fields necessary to create a standard way to export and exchange basic programming. 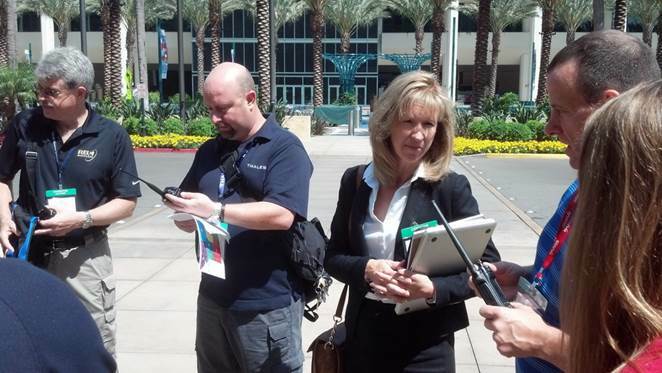 Participants in the test, Harris Public Safety and Professional Communications (PSCR), Icom America, Motorola Solutions, Relm Wireless, Tait Communications, and Thales Communications, joined by public safety participants, tested and confirmed that their radios could recognize different manufacturers’ programming feature sets. AASHTO and APCO Present Awards for Service to Public Safety: NPSTC’s Executive Director and founding member, Marilyn Ward, and Chief Harlin McEwen, representing the International Association of Chiefs of Police (IACP), both received the President’s Award at the APCO conference in Anaheim, CA. The American Association of State Highway and Transportation Officials (AASHTO’s) Special Committee on Wireless Communication Technologies, meeting in Irvine, CA, also presented awards to Ms. Ward and Chief McEwen, NPSTC, for their service to public safety communications. This was a busy week for many of us. APCO’s convention took place in Anaheim, CA, and it was a week of meetings, events, conference sessions, walking the show floor, and of course, many parties. From what I saw, the convention was very well attended. The sessions, including mine, were packed, the show floor was busy, and the side meetings were productive all around. My session was on Sunday and I spoke about how to prepare for FirstNet–not only how to make use of commercial broadband but also how to start working cross-agency, what types of devices are available, what is coming, and a few pointers on how to get the very best pricing from the commercial LTE vendors. The PDF of my slides can be found here: (http://andrewseybold.com/wp-content/uploads/2013/08/APCOWhileWeWait-Final2.pdf). I found it disturbing that there were so many exhibitors still pushing Voice over LTE and demonstrating their own, proprietary PTT services over LTE. I was also disappointed in the lack of tablet computers shown on the floor. Tablets will be very important for incident commanders, logistics, and even for those performing building and other types of inspections, yet they have not begun to show up in any numbers. What was on the floor was many mobile devices, call them modems, call them routers, whatever you call them, these will be the first devices installed on the network and most of the ones I saw on the floor supported the PSBN, a least one commercial network, Wi-Fi and/or 4.9-GHz, and at least USB connectivity for laptops. I was very surprised that I did not see a single LMR mobile radio with LTE onboard, which to me would be a perfect product. Most LMR mobile radios have room in them to add an LTE modem and it seems logical that this combination could save money in the long run. The National Public Safety Telecommunications Council (NPSTC) and the Association of Public Safety Communications Officials – International (APCO) signed a Memorandum of Understanding (MOU) on August 7, 2013. This partnership will enable appropriate public safety technical requirements developed through NPSTC’s Committees and Working Groups can become American National Standards Institute (ANSI) standards through APCO’s position as a Standards Developing Organization (SDO). This partnership will ensure public safety grade standards that will be so important as NPSTC develops the broadband requirements for the Nationwide Public Safety Broadband Network (NPSBN) and will strengthen public safety broadband communications in the U.S.
September 18, 2013 in Abbotsford, B.C. September 26, 2013 in Whitehorse, Yukon. These two meetings were made possible in part through a grant from the Motorola Solutions Foundation, and are part of an ongoing series of regional workshops across Canada. U.S. and Canadian representatives from fire, police, EMS and emergency management agencies and others are urged to attend! For complete details, and to register for this free event, visit our event listings at www.citig.ca. Presentations from the first four CITIG cross-border forums (Sarnia, Lethbridge, Saint-Jean-sur-Richelieu and Saint Andrews) are now available on the CITIG Web site (under past meetings on the Resources page). As well, CITIG’s cross-border work will be highlighted during the Seventh Canadian Public Safety Interoperability Workshop! Sharon Counterman brings over 36 years of experience in the public safety field. Ms. Counterman is currently a consultant with L.R. Kimball and Associates, leading the Operations Team within the organization. She is the former Deputy Director of Greater Harris County 911 Emergency Network. Ms. Counterman is the former Director of the fourth largest Public Safety Answering Point (PSAP) in the United States, the Houston Emergency Center, Houston, TX. She is retired from the Las Vegas Metropolitan Police Department, Las Vegas, NV, where she was the Operations Director for the Communications Center, with 28 years of service. FirstNet’s broadband network will offer public safety new tools to help accomplish the mission and, for many years, will supplement—rather than replace—public-safety land mobile radio. Recently there has been considerable discussion whether and when public safety can rely on voice for mission-critical communications over the planned nationwide, public-safety broadband Long Term Evolution (LTE) network. Having been active in law enforcement and public safety for over 50 years, I have experienced a variety of technology and operational transitions, including a number of those in public safety communications. During my career, I have seen the introduction of different frequency bands, trunked radio operations, and digital radio. In each of these cases, the new communications tools that resulted have supplemented existing operations, with both used together side by side, often indefinitely. As new capabilities have been introduced, it has been important to ensure that the new technology or approach meets public safety’s needs in the stressed environment in which we operate, before abandoning systems already being used.